Corporate users of Microsoft Excel utilize large spreadsheets encompassing many rows and columns. Regardless of whether the spreadsheet is being used for budgeting, cash projections, depreciation, or acquisition analysis, there are usually a few cells containing some critical piece of information. Most users constantly scroll left and right, or up and down, to see the effect of changes on these critical cells. 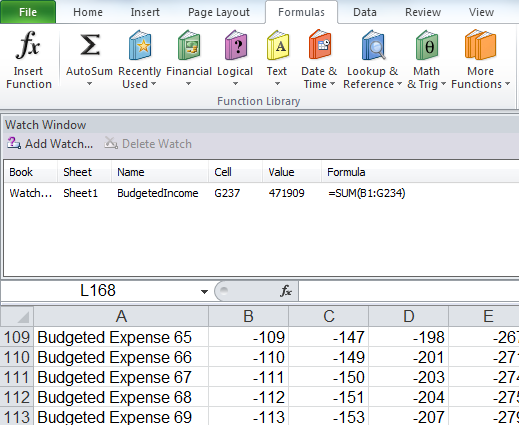 Excel contains a feature known as the Watch Window. The Watch Window is a floating dialog box that displays the value of your ‘critical cells’ even when those cells are not currently displayed. Using this feature will not only save time, but also carpal tunnel syndrome. This will display the Watch Window. Click Add Watch on the menu bar. This displays a pop-up allowing you to either type a cell (or range) address or by clicking the icon, select the cell (or range) with your mouse. When the correct cell (or range) is shown in the pop-up, click the Add button. The Watch Window will then display the book name, sheet name, optional range name, cell (or range) address, current value of the cell, and the formula contained in the cell. You can continue to add more additional items to the Watch Window by clicking on Add Watch on the menu bar. The Watch Window will remain ‘in your face’ as you move around the spreadsheet. However, you also have the option of docking the Watch Window below the ribbon by dragging the window up towards the ribbon until it snaps into place. You can turn off the display of the Watch Window by either clicking the Watch Window icon on the Formula ribbon or by clicking the ‘x’ in the upper right corner of the Watch Window.